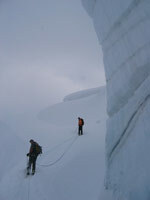 Scott and any other guide associated with Newsomesnow Quest Inc. will be professionally certified by Canadian Standards in snow safety: Canadian Avalanche Association, first aid and guide organizations; Association of Canadian Mountain Guides and Canadian Ski Guides Association. All guests will be trained in avalanche self/group rescue and avalanche transceivers. Back country snowboarding has inherited risks, from helicopters, snowcats, avalanches and other natural hazards associated with mountain travel. Price: $300 per day per person + $25 extra per person. Deposit Required. Lunch included. Here in Revelstoke we are extremely fortunate to have several amazing options for backcountry splitboard touring. Some of these include over 30 backcountry lodges to choose from, Glacier National Park, the brand new Revelstoke Mountain Ski Resort area and heli assisted touring. Although there are several lodges to choose from in this area, the trip must be booked in advance due to availability for requested dates. You can choose from touring, heli assisted touring or lift accessed touring from RMR and find the local ‘Revy Secret Stashes’. Just when you think your season is over, it’s just getting good in the Canadian Rockies. With peaks well over 10,000 ft and huge glaciers, temperatures stay cool. Depending on availability of lodges, catered or non-catered, fly in or ski in etc... 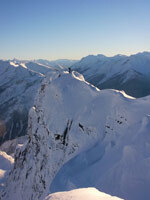 Check out the above Splitboard Touring and Mountaineering for dates and info.